I remember the day that I met Miss Sunnyslope, although the year, which must have been in the early '90s, is kinda foggy in my memory. But she made a vivid impression on me! She was in a thrift store in Sunnyslope that I used to go to, on Hatcher and Central Avenue, where I looked for antique cuff links, tie pins, and that sort of thing. I wore a suit to work, and enjoyed the slightly-goofy aspect of "accessorizing" with old-time stuff. 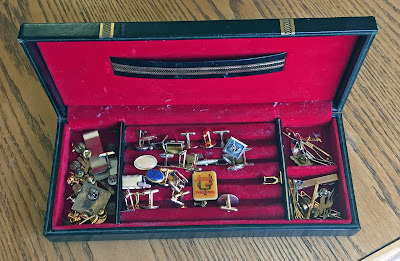 I was on the lookout for Valley Bank cuff links, and never found them, but I found a lot of cool old stuff at that thrift store. And Miss Sunnylope of 1949. 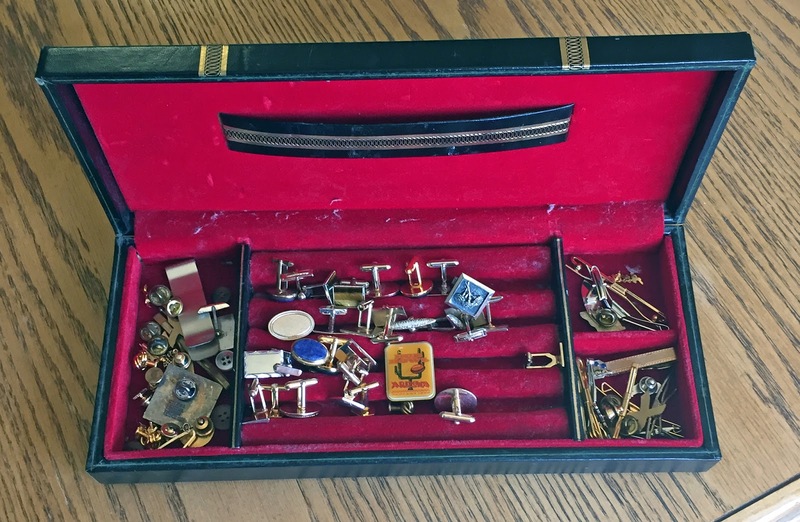 She overheard me talking to the clerk and approached me, saying that she had a whole collection of wonderful stuff that her husband had left behind. I asked her if she would bring them there to the thrift store, where I could see them, and possibly buy them. Looking back now, that wasn't really fair to the store owner, but I didn't know what else to do. She did. She insisted that I come and look at them, at her house nearby. I went there a few days later with my girlfriend, and it was quite a sight. She lived there with her sister, and from what I could tell having won Miss Sunnyslope in 1949 had not made her rich. She showed me a newspaper article, and I've been looking for it ever since. 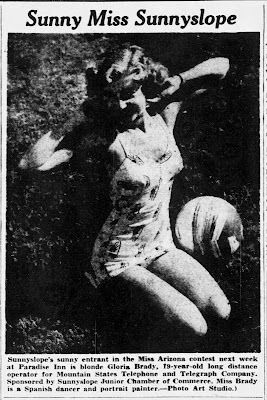 There she was, young and beautiful in a one-piece "bathing beauty" swimsuit in 1949. I don't recall if I paid her for the collection of tie pins, cuff links, etc. that she gave me, which included the case. She may have just given it to me, she was so pleased to have visitors. It didn't look like the ladies got many visitors! I still have the case, and over the years I added more things to my collection. I haven't worn a suit for many years, but through the '90s I did, and if you looked carefully I was also wearing a bit of Sunnyslope history. Update: her name was Gloria Brady, and she was Miss Sunnyslope until 1964.